This article is about the Tribunal Temple in Mournhold. For the Tribunal Temple in Ebonheart, see Tribunal Temple (Ebonheart). 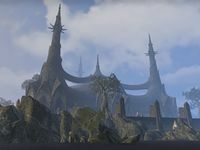 The Tribunal Temple in Mournhold is the center of theopolitical power in Morrowind, and acts as a cathedral to the Living Gods of the Dark Elves: Almalexia, Vivec, and Sotha Sil. The Tribunal Temple is a large temple in the northern section of Mournhold in Deshaan. Almalexia, who is related to several quests in Deshaan, can be found inside. Tribunal Temple Objective: Protect the Tribunal Temple from the Maulborn menace. The Tribunal Temple appeared in the Tribunal expansion of Morrowind.